It was bad officiating. Yeah, that's it. Jacksonville, October 8, 2006 - Not since Princeton lost to Holy Cross 46-0 in 1989 have I rooted in person for a team that suffered such a lopsided defeat. Well, I'm not hugely invested in the Jets anyway. Here in New York, you can go through life without ever being reminded of the fact that football is played only a few miles away. Things are different in Jacksonville, where every other house, car, and store seems to fly a flag for the Jaguars, the Florida Gators, or both. 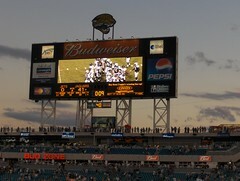 It turns out that Jacksonville is the only place I've ever seen a professional football game. My parents are season ticket holders, so we'll go to a game when we and the Jaguars are all in town. Football is one thing to do down there. Golf is the other thing to do. So we played golf with my parents this past weekend, too. If you could call what Sue and I did playing golf, that is. Sue could barely hit the ball at all, and I could hit it well only occasionally. And the less said about my putting, the better. But we had a good time regardless - my parents were happy to have us along, and driving the golf cart around is really fun! But that's not all we did over the weekend. Sue's parents came up from Orlando for a day, and my parents took us all to an IMAX movie ("Open Season" - meh) before going to my mom's surprise 60th birthday party (which was at the University Club on the top of one of Jacksonville's tallest buildings). My mom had no inkling of it at all, especially since her birthday was about six weeks earlier. So she was happily surprised, we all had a nice time, and there was an open bar, which helped with the nice time. This weekend we have no trips planned anywhere! Sue's at the Mets game tonight (she was supposed to go Wednesday when I had class, but that was rained out and rescheduled for today), and I went out to dinner with friends (to a nice new restaurant that opened up a block away). Tomorrow night we have a birthday party to go to, and Sunday we're having my brother and his family over for dinner. That counts as an easy relaxing weekend for us.